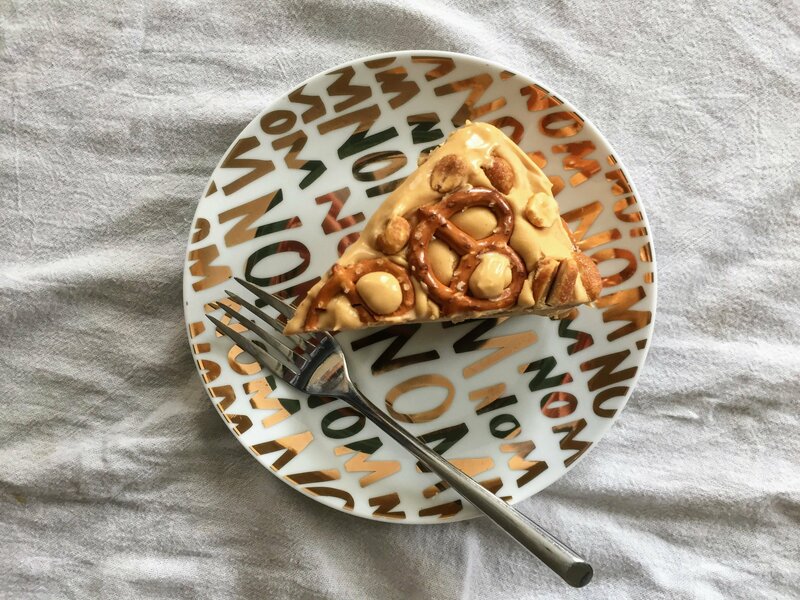 Who needs candy bars when you’ve got cake? I’d pick cake just about any day, but with this one, you don’t have to choose! 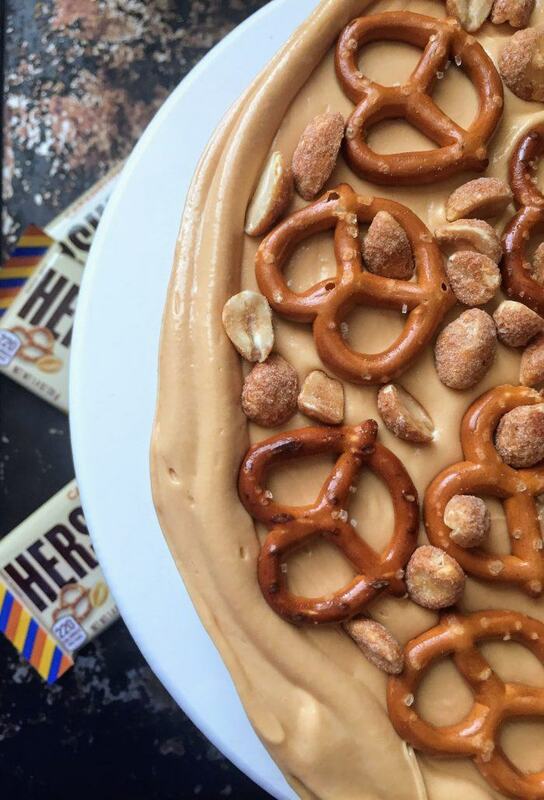 It combines the sweet and salty flavors of caramel, peanuts, and pretzels to make a Hershey’s Gold-esque layer cake! It all started when earlier this year, a coworker brought mini Hershey’s Gold Bars to work and stuffed them into our mailboxes. I discovered mine when I went to check my newly relocated mailbox, now on the top row, and one fell out and almost hit me in the head. (Side note: I am 5′ 2″ on a good day.) My new mailbox is on the top row and touches the ceiling. When I first saw it, I said outloud to no one in particular, I’m going to need a stool,” to which our building manager replied: “I got you.” Lo and behold, there was a stool there. I didn’t know whether to be miffed or grateful. Anyway, I threw the candy bar back into my mailbox and decided to save it for when I really needed it*. *When I forgot to pack a square of dark chocolate to enjoy with my coffee as my afternoon ritual. Ask anyone on my team, it’s a thing. Every day. *When it was the week before spring break, and I was READY TO GO. *When there was nowhere to sit and work in the building except the counter underneath the mailboxes. In the middle of the teacher workroom. With conversations, classes, and jamming copiers all around me. To get back to the cake situation, what I’m trying to say is that these candy bars are amazing and deserve to be incorporated into the “permanent shelf status” Hershey’s collection. In case that doesn’t happen, we’ve got this cake on backup. It’s a brown sugar-based layer cake that comes out tasting nice and caramel-y. Then we smother it with a dulce de leche cream cheese frosting (if you’ve been reading my blog for awhile, you’ve seen this stuff before.). And to decorate, handfuls of honey roasted peanuts and pretzels. It’s a salty/sweet lover’s dream. The one thing I could have improved upon is adding a little more salt to the frosting. If you don’t mind a ratio of 40% salty: 60% sweet, the frosting recipe is fine just the way it is, but if you’re looking for the candy bar ratio, which is more like 60% salty: 40% sweet, throw in an extra 1/2 teaspoon or so of salt. And as a note, the pretzels do get a little stale, so plan to enjoy this cake as soon after decorating as possible! I took a hint from Joy when it came to decorating the cake. 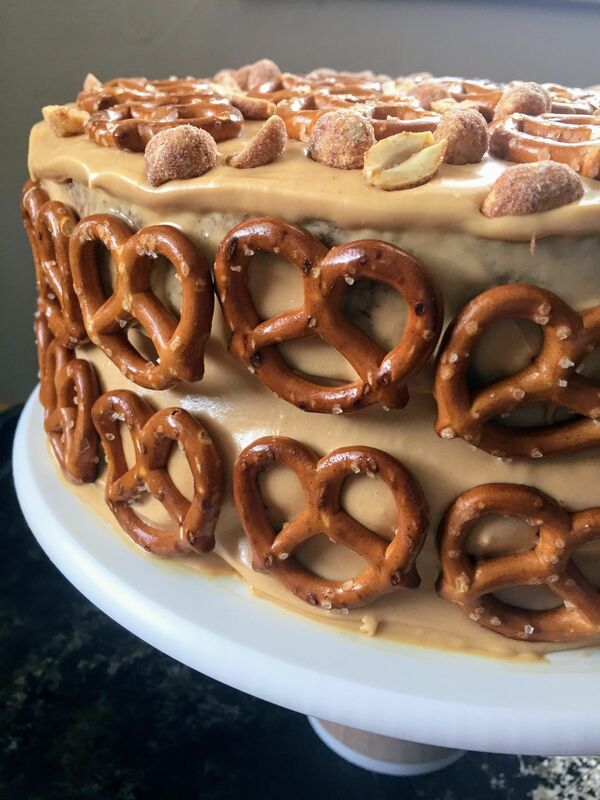 And, to keep the pretzels and peanuts inside the cake in place, I piped a thin border of frosting around the edge of the bottom layer of cake. Nothing fancy or intimidating, just some frosting spooned into a ziploc bag with the top cut off like this. For a while, I was turned off to the salty/sweet combo. I remember seeing some kind of honey Chex mix at the store or a party and thinking, “That’s gross. Give me my garlicky bagel chips.” But something (probably salted caramel sauce) led me to see the light, and now I’m all about that life. (Exhibit a, b , and c.) …all about that life to the point that this cake made an appearance at my birthday party! The lighting isn’t the best, but a cake covered in candles (ahem, sparkler candles that continually relight even though they weren’t labeled as the trick kind!) is too fun to resist! 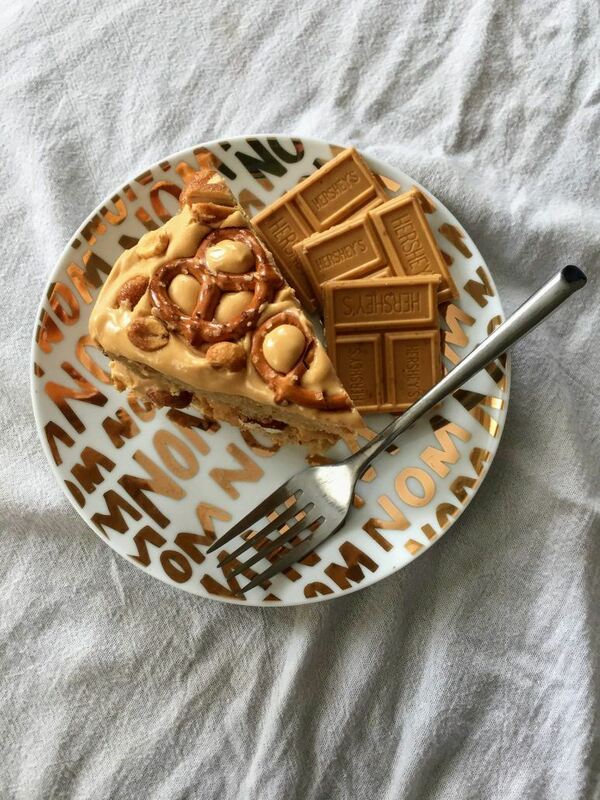 Make this cake and let me know how it goes! 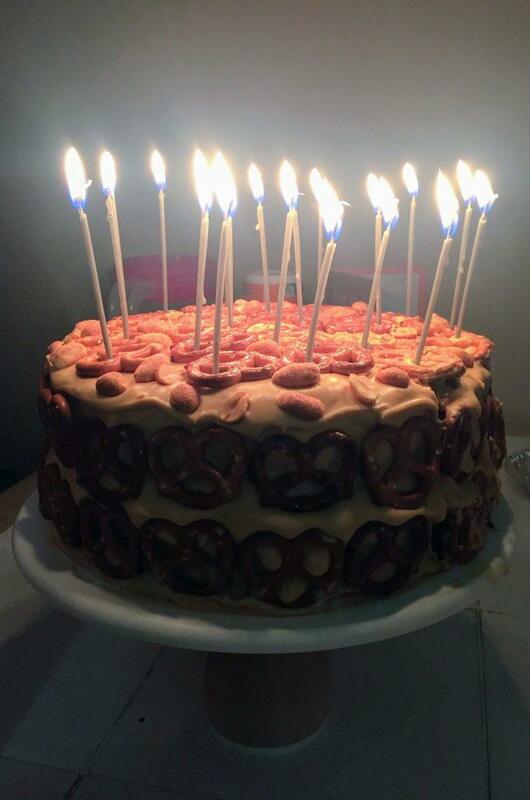 A brown sugar and caramel cake inspired by Hershey's Gold bars, decked out with peanuts and pretzels for added crunch! Preheat the oven to 350 degrees and prepare cake pans by lining them with aluminum foil and nonstick spray. Preheat the oven to 350 degrees and prepare two 9-inch cake pans by lining them with aluminum foil and nonstick spray. Beat melted butter and brown sugar on medium speed until there are no brown sugar lumps. Mix in eggs, vanilla, yogurt, and milk on medium speed until combined. In a separate bowl, whisk flour, salt, baking soda, and baking powder together. Pour the dry ingredients into the wet ingredients and mix on medium low until no lumps remain. Be careful not to overmix! Pour batter into prepared pans and bake for 30-32 minutes, turning every 10 minutes to prevent uneven browning. My cake layers took 32 minutes. Add in dulce de leche and beat on medium high until smooth, about 45-60 seconds. You will need to scrape down the sides to ensure that everything is mixed smoothly. Add 2 cups of powdered sugar, vanilla, and salt. Beat slowly until everything is incorporated. Then beat on high for 30-60 seconds, adding additional powdered sugar until desired consistency is reached. Frost or pipe onto cake. To assemble the cake, first level each cake layer to create an even surface. Then invert first cake layer onto a cake stand and frost. Fill with chopped honey roasted peanuts and pretzels as desired. Then invert second cake layer onto first cake layer. 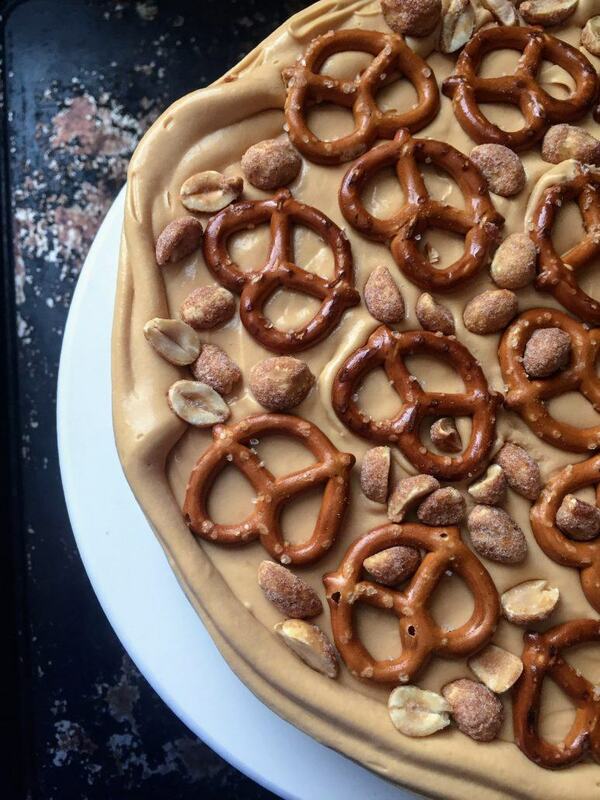 Frost top and sides, garnishing with honey roasted peanuts and pretzels as desired.